Center for Economic Research and Forecasting | Dan Hamilton, Ph.D.
Dan Hamilton began working with Economic Forecast models in 1997. The Wharton Econometric Forecasting Associates (WEFA Group) had been formed earlier by Lawrence Klein, Nobel Prize winner, and had since been converted to a private company specializing in Economic Forecasting and Consulting services. For three years with the WEFA Group, (now known as Global Insight), Hamilton produced forecasts and helped clients interpret the forecasts, generated sensible alternate scenarios, and communicated forecasts to non-technical audiences. He conducted professional forecast training workshops for publicly open courses offered by WEFA and in closed-door private sessions with certain clients. Some of the clients were large United States agencies that cannot be specifically named here. Other clients included Visa International, the Panama Canal Authority, and the Central Bank of Netherlands Antilles. In 2000, Dan joined the UCSB Economic Forecast Project with Bill Watkins. In that position, he worked for the following clients: Vandenberg Air Force Base, the County of Santa Barbara, the California Environmental Protection Agency (via the city of Santa Maria), the Sares-Regis Group, Santa Barbara Cottage Hospital, Davies Communications, Shea Homes, the Towbes Group, the Ojai Sanitation District, and many others. He has partnered on projects with: Booz, Allen, Hamilton; the Matrix Design Group; and Design, Community, and Environment. While with UCSB, he built and maintained a variety of forecast models in Eviews, including models of the United States, California, and Oregon. He also built several forecast models in Excel, including models of Grade-school enrollment and Commuting. 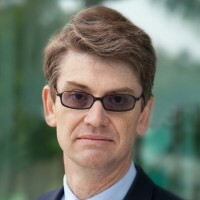 In June 2009, Dan Hamilton joined Bill Watkins and Kirk Lesh in forming a new Economic Forecast center at California Lutheran University (CLU). This is the Center for Economic Research and Forecasting at CLU, or CERF. They also formed a new M.S. in Economics program that will focus on teaching the applied tools for Economic Forecasting. Both of the new CLU initiatives will yield new products to be released or available by Fall 2009.